World is globalized…is it, or was it not always? Well, it is not evenly globalized, and you need to understand the extent of globalization based on your world i.e. your product or your service or your market or your country. 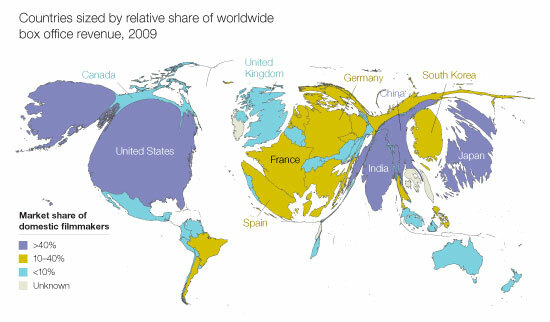 Pankaj Ghemavat in his Mckinsey article talks about root maps that show the extent of globalization for your pie of the economy. He takes an example of the entertainment industry which maps hollywood’s map as that of English speaking parts of the world and then contrasts it with the Bollywood map that follows the Indian Diaspora. I think this is a very interesting data analysis, that can be a very important input into your strategy and planning. This clearly shows you where is your string customer base and where are the potential new markets. Think of intersecting this map with a English speaking world map for Hollywood and Diaspora concentration map for Bollywood and you would know where the untapped potential for both the products lies.